Support us and get a great shirt! All funds raised will be paid directly to DevReps, LLC for Show production, help with conference travel, sound equipment, transcriptions. For a long time, tech culture has focused too narrowly on technical skills; this has resulted in a tech community that too often puts companies and code over people. Greater Than Code is a podcast that invites the voices of people who are not heard from enough in tech: women, people of color, trans and/or queer folks, to talk about the human side of software development and technology. Greater Than Code is providing a vital platform for these conversations, and developing new ideas of what it means to be a technologist beyond just the code. Featuring an ongoing panel of racially and gender diverse tech panelists , the majority of podcast guests so far have been women in tech! We’ve covered topics including imposter syndrome, mental illness, sexuality, unconscious bias and social justice. We also have a major focus on skill sets that tech too often devalues, like team-building, hiring, community organizing, mentorship and empathy. Each episode also includes a transcript. So much love for all the hard work you've done and are continuing to do! Really excited to see where this goes. When I pay for content, creators have a relationship with me, instead of advertisers. Because people matter. Too many places forget that. And I've forgotten in the past. 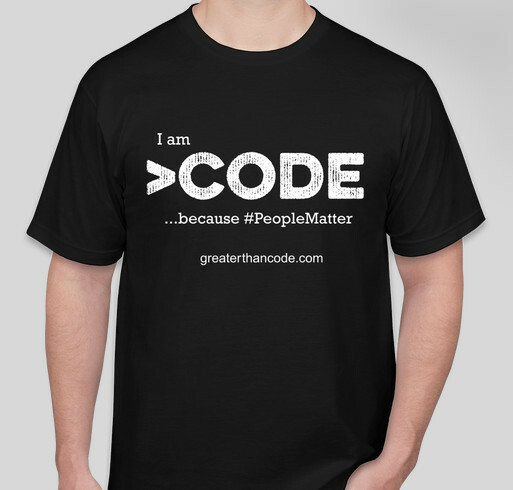 Share Why You Support "Greater Than Code Shirts!"